Registrar of the Deeds Registry, Azeena Baksh was Tuesday charged with obtaining money by false pretense. Thirty-three year old Baksh appeared before Chief Magistrate Ann McLennan and denied the allegation that while being employed by the Judicial Service Commission between May 1, 2014 and and January 31, 2017 in Georgetown caused or procured valuable securities in the sum of GYD$4.5 million to be delivered to her Bank of Novia Scotia account for her own use pretending she was a contracted employee at the Deeds Registry. She is in fact a pensionable employee. 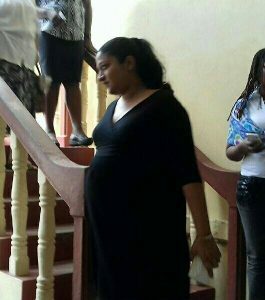 Defense Counsel, Nigel Hughes in his bail application asked that his client be released on self bail since she is in her final trimester of pregnancy and was ordered to take bed rest. Hughes added that upon hearing of the possible charge, his client was cooperating with investigations at all times. On the other hand, Police Prosecutor Arvin Moore requested bail in a substantial amount under the condition that she lodges her passport and reports to the Fraud Department of the Criminal Investigations Department every Friday at 9 AM. The Chief Magistrate granted bail in the sum of GYD$250,000. Baksh will return to court on June 6.